Raymond Mwaura is a psychosocial counselor at CVT Nairobi. In my work with refugee torture survivors, I see enormous change as clients go through counseling and begin to feel safe and to trust. I see these changes in the individuals, but I also see change that happens on a wider scale, within communities. At CVT, the care we provide is about helping people restore meaning and purpose in their lives. They become able to deal with the past and that means they can change their future. My role as a counselor today is to restore human dignity. At CVT, we are helping to heal emotional wounds. The clients we see need healing from torture and sexual abuse, but we also need to keep in mind the challenges they face as refugees living in an urban environment. They’re homeless – they are in transition in a new place. We must provide help with emotions they feel as well as help with the purpose they feel in their lives. The past miseries of war – these are the past. But clients must deal with continuous trauma because of the uncertainties and challenges of life as refugees. 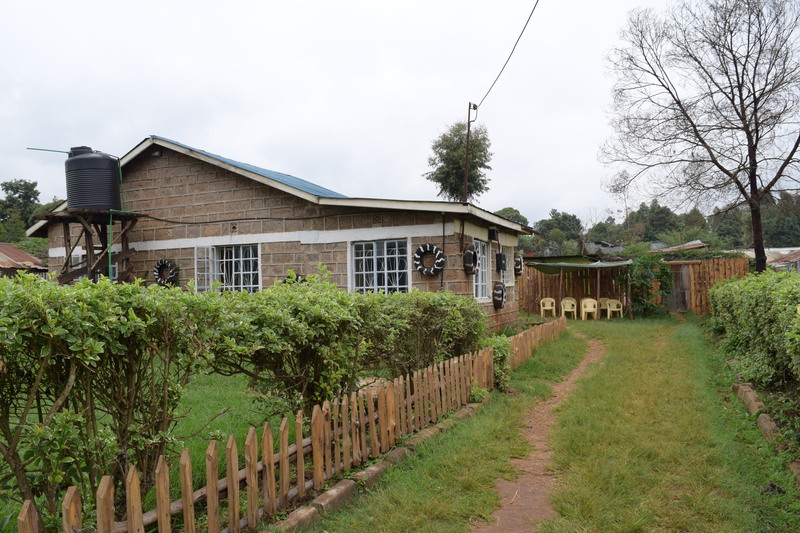 Survivors at CVT Nairobi are dealing with grief, loss and also ambiguous loss. Many left their country without seeing what happened back home. They don’t learn about it, and this creates many problems. The most important thing about my work is providing that safe space so clients can share their story and trust this process – trust that it’s correct and trust that they’re empowered, that they feel honored. Before, because of torture, many survivors tell us they felt that they were not human beings. I am a Master’s degree candidate in Marriage and Family Therapy, with a specialization in trauma counseling among youth and children. I have always had a drive to help children – I care about the lives of children in Kenya. I’m an orphan myself, and I struggled with grief and loss as a young person. I know so many children don’t have mentors or help with their pain. So from the beginning of my career, I worked to help children deal with grief and loss. I was very vocal in families to help children, to provide them with mentors and work on drug and substance abuse problems. For some time, I worked with the media as a national television panelist; this was a way to publicly discuss issues affecting children and assist families through the media. I also worked in Kakuma refugee camp in a church program, where I was introduced to refugee projects, working with South Sudanese refugees. Many were dealing with emotional pain as a result of conflict and war. This is where I learned of CVT and applied for an open position – I wanted to continue helping people rebuild their lives after torture. At CVT, we help clients build trust. We see clients not just as victims but survivors. We listen to their stories and validate them – this sets the foundation so they can deal with the past, reflect on the present, and look at the future. Starting at CVT can be difficult for refugees. I remember a Burundian family who came in for an intake interview. They had been in Kenya seven months, but they still could not speak about what had happened to them. I gave them the space they needed to sit with their feelings, to feel the emotions. For all clients, in their moment of crying, I let them. I remain calm, not surprised. I give them time, give them tissues. When a client feels safe, she can speak. Even in cases where a woman was raped, she can tell her story to a male counselor when she knows she is safe and the counselor is listening. CVT is an open space. We let clients know they can get in touch, they can relax, show up. We have time for them. We tell them, “I’m here for you.” CVT is a place they can trust. I think about the long-term positive impacts of this healing work, and I see hope especially for a country like Burundi. The world doesn’t see it as a war-torn country. But young people have left because of the war, and they are angry; they want revenge. But now here in Nairobi, they are refugees. Most agencies see women as the most vulnerable, and these men are not regarded as vulnerable. Yet often they are suicidal. Many struggle with substance abuse. Hope is there when I see that they have dealt with these feelings of revenge, when they are able to say, “If I go back and get revenge, I will merely hurt the people who hurt me. I will cause more suffering.” Clients become able to forgive themselves and others. 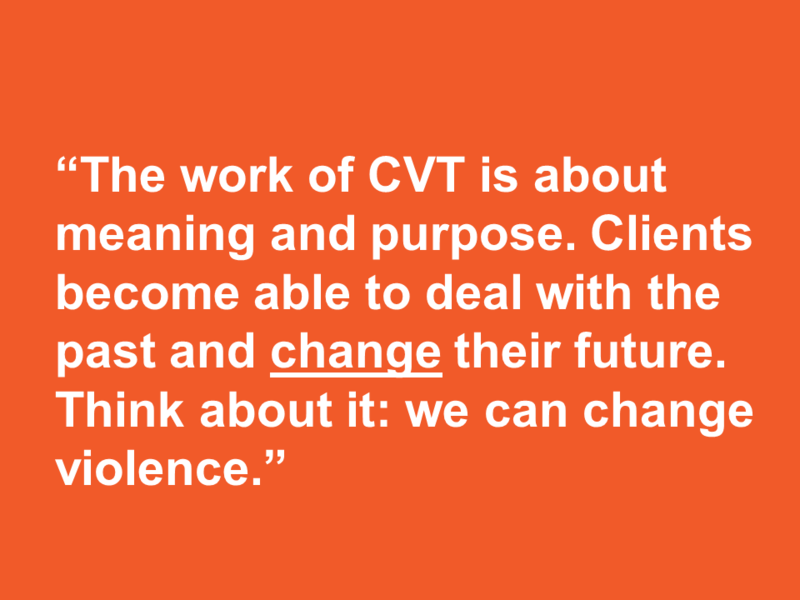 The work of CVT is about meaning and purpose. Clients become able to deal with the past and change their future. Think about it: we can change violence. We can be peace makers.